As he showed in River Boy, Bowler's particular gift is to normalise the supernatural in his treatment of family relationships, making the ghosts of dead relatives or past selves a believable presence in his characters' lives. 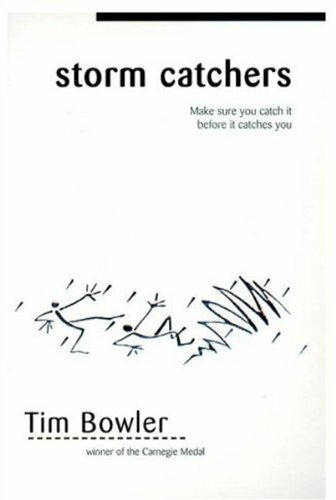 Storm Catchers develops into another such story. To begin with it seems to be a conventional thriller based on kidnapping and extortion, in the hackneyed setting of the Cornish coast, with smugglers' caves, cliffs, lighthouses, and storm-washed islands. Gradually, however, it becomes clear that the kidnapping of 13-year-old Ella is not a money-motivated crime but an act of domestic revenge for earlier tragic events in her family history. The intermediary between everyday reality and the supernatural is Ella's three-year-old brother Sam, whose gifts of telepathy and second sight are matched by his skill in using a dowsing device, the magic pendulum, which can find the whereabouts of missing people. A living avenger and a restless spirit combine to drag past secrets into the light of day. As a thriller, the book is certainly a highly readable pageturner, but its idea of justice and retribution may seem strange to a present-day reader. The 'villain', Ella and Sam's father, is just a fallible human being, and unlucky in his self-righteous family, with whom our sympathies are supposed to lie. Bowler invokes the Greek Furies, but the reader may not share his apparent taste for them as a model of justice.